When the games ended Thursday night and I considered the results, my stomach sank. The world craves variety, but the unavoidable, incorrigible ACC had reeled me in again. If you’ve read Grantland’s college basketball coverage over the past two weeks, you probably think my official title is “junior ACC correspondent.” Today, I had actually planned to write about the Spartans of Michigan State, whose easy 69-55 win over Wisconsin served the usual Tom Izzo narrative of a team peaking at the perfect moment. But how can I avoid the real story? My hands are tied! What can I possibly do when the ACC, like some kind of insane nocturnal mailman, just delivers night after night after night? I heard the knocks on the door, and I tried to ignore them. I promise I did. But this conference can’t be stopped. Dormant for so long, the teams of the ACC finally have their revolution, and man are they seizing the day. Actually, forget the mailman. I’m more like the narrator from “The Raven,” trying to ignore the unchanging reality in front of me, but slowly going mad in the process. Florida State came back from down eight with 1:29 left and won by a point? Duke trailed by 20 to NC State midway through the second half and won by five? Sorry, Michigan State, but your time will come. This is the winter of the ACC. The situation going into the week looked like this: Duke, Florida State, and Carolina all sat atop the league at 8-2. Virginia was the fourth team, but had been struggling. NC State and Miami were the other NCAA hopefuls, and each had a big chance to earn what might be a tourney-clinching win. Defensive-minded Virginia began on Tuesday by looking lifeless in a bad loss to Clemson. Then Carolina absorbed Miami’s first-half blows before roaring to a relatively easy win on Wednesday, moving to 9-2 and waiting to see if Florida State and Duke could follow suit Thursday night. Let’s start in Tallahassee. When you think of Florida State basketball, what comes to mind? Probably great defense and low-scoring games. Maybe you remember Michael Snaer’s dagger that ended Duke’s long home winning streak earlier this season, or the incredible 90-57 home win over Carolina. But here’s something else to keep in mind — turnovers. Take a look at the Four Factors chart from Thursday night’s 48-47 win over Virginia Tech. How does a team with a 47 percent effective field goal percentage score just 48 points? Slow pace, for one; FSU averages 69 possessions per game, but had just 55 on Thursday. An inability to get to the line, for another; the Noles’ 16 percent free throw rate was the second-lowest of the season. But an equally important factor is turnover percentage. The eventual winners gave the ball away on 27.3 percent of all possessions Thursday, a number that looks extraordinarily high until you consider that it’s just a skosh above their 24.3 percent average. And that number, as KenPom tells us, is 330th in Division I. Not good. So turnovers, slow play, and a lack of fouls damned the Noles to a 45-37 deficit with 90 seconds on the clock. I’ll ignore the possible tournament implications of scoring 37 points in 38 minutes of action, at least for now. Instead, let’s look at the ingredients of the end game. FSU’s Jeff Peterson nailed a 3. Okaro White hit a layup. Peterson found Ian Miller for another 3. It ended with FSU holding the ball with 10 seconds left, down two. In the midst of it all, hapless Virginia Tech missed five of six foul shots with their jackboot on Florida State’s throat. The Seminoles had reached 9-2 in conference. What you got, Duke? What Duke had was a 20-point deficit at home with 11:19 on the clock. The main thing we’ve learned from the Blue Devils this year is that we should be skeptical when we feel optimistic, optimistic when we feel skeptical, and confused at every moment. Duke will lose to Temple. Duke will beat North Carolina in the Dean Dome with a miracle comeback. Duke will look hideous against Ohio State. Duke will beat Kansas, Michigan State, and Michigan. Cameron Indoor Stadium, where Duke previously won 45 straight games, will provide almost no homecourt advantage. The famous Cameron Crazies will stop turning up for games. And NC State, the Triangle’s third wheel, will be up 20 friggin’ points, 11 minutes away from punching its tournament ticket. How did it come to this? Well, the microcosmic last-night version is that the first 30 minutes were a nightmare. Duke shot 2-for-14 from 3 in the first half. Lorenzo Brown, State’s athletic 6-foot-5 guard, was giving the weak perimeter defenders nightmares on his way to scoring 19 points. And just for kicks, the Plumlees combined for three missed dunks. THREE MISSED DUNKS! Actually, that might be the worst video ever. The first dunk comes after the TV timeout, so you can only see it in the distance. (Although, like the Medusa, you should be careful about looking a missed Plumlee dunk in the eye.) The second one is a block, even though it says “missed dunk” on the box score. The third, however, with Mason Plumlee falling over after stuffing himself on the rim, is a classic of the genre. 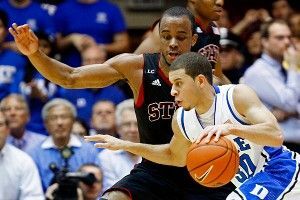 Things looked badder than bad at 61-41, but that’s when Seth Curry and Austin Rivers came out of hibernation, rumbling angry out of the cave. In 11 minutes, the two combined for 26 points (16 for Curry, 10 for Rivers) to lead a ridiculous comeback that left the Wolfpack shell-shocked and dead on their feet. Over the same stretch, State shot 4-for-17 and turned the ball over five times. Which, incidentally, was the total number of times Duke turned it over all game, by far its lowest total of the season. 3. Positive, the Universe: Like Carolina and Florida State, Duke managed to reach 9-2 in anxious, clumsy fashion. But reach it they did, and all three teams still control their own conference destiny. Heading into the weekend, the unbelievable drama at the top of the ACC is alive and thriving.